Quinn officially slept through the night last night and didn't wake me once. 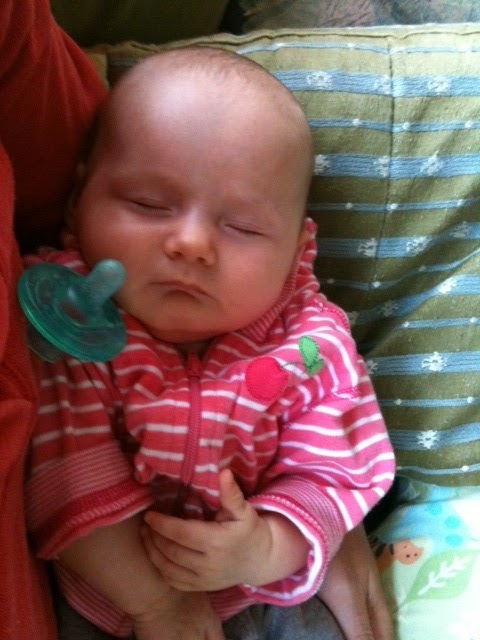 Yes, she has slept through before but usually wakes me around 4-5am-ish wanting her soother. They both love to stand and jump. I feel like I'm running a circus on most days. I need to drain their energy (especially Teagan's), so that they'll have quality naps! My Dad bought them two Jolly Jumpers for their house so that the girls can have a jump off! The scale that we used to measure them a week or so ago was off by a pound. They are weighing in at 14lbs (T) and 11lbs (Q) give or take a few ounces. They have a check up on Monday so I'll have the official weights then. They are giggling and smiling like crazy. They especially like my brother's "fish face." They are also "talking." This has to be one of the most adorable things I've ever heard. We'll sit with them and they'll babble on and on to us. Yesterday, when I was feeling absolutely horrible, I reached out to my family to see if someone could come by today to help me for a few hours. The response was amazing, albeit not surprising. Within minutes, my Dad and brothers said that they would be over to help me. My Mom ended up coming over in the morning. My brother, Rob, came by in the late morning. My other brother, Michael, came by to take the boys for a much-needed run and to hang out for a bit. My Dad came by at 2 and stayed for a few hours. My aunt also offered to come by but I had more than enough help and didn't want her to have to make the 45 minute drive to my place. I feel so unbelievably blessed to have the family that I do. Whenever one of us is in need, everyone rallies and does what they can. I naively thought that this is how all families operated but found out a few years back that, that isn't the case. We can have all the money in the world, fancy cars, huge houses, material possessions galore, but it means nothing without the love of family. I've come down with mastitis for the second time. Mastitis is a breast infection, which may not sound horrible. What makes mastitis so awful are the flu-like symptoms that you experience. It comes on very quickly. I became exhausted, had chills/sweats, fever, body aches, nausea, all in a matter of hours. Fortunately, this bout hasn't been nearly has bad as last time. I hate taking OTC or prescription medication, but with such a fast moving infection and babies to care for, it was a must. Pump or feed your baby from the infected breast every 2-3 hours. Note: Feeding through the infection is the best thing you can do. It does not affect your baby because he/she is getting antibodies from you. Prior to pumping or feeding, put a hot compress on the infected area for 10 minutes. While feeding or pumping, massage the area. I won't lie, it feels awful. It feels like you're massaging a bad bruise but this is the quickest way to get rid of the infection. Sleep LOTS! When you've had the flu, wasn't sleep the best medicine? Yes, you have a baby(ies) to care for, but if you don't take care of yourself first, you won't be able to care for the little ones. Get help from family and friends. Take 1000mg of vitamin C every 1-2 hours. Echinacea is also a great immune booster. Advil helps with the body aches so that you can sleep more soundly. I think of illness and your body's way of telling you to slow down. I've been saying for a while that I feel like a hamster on a wheel. 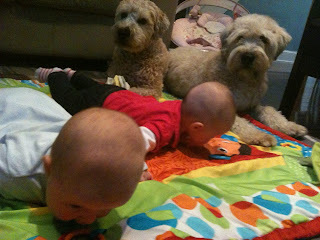 I have my routine with the babies and was scared of slowing down because I'd fall off the wheel. Well, my body did it for me this time. Listen to your body! I know that's hard to do when you have kids at home, but without our health, we have nothing. 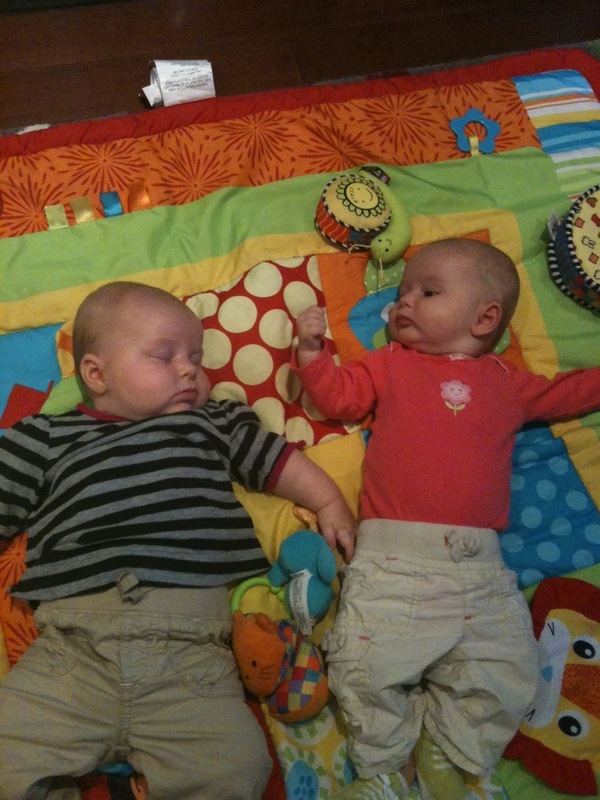 If you're exhausted, try to get someone to watch the kids for an hour while you squeeze in a nap. 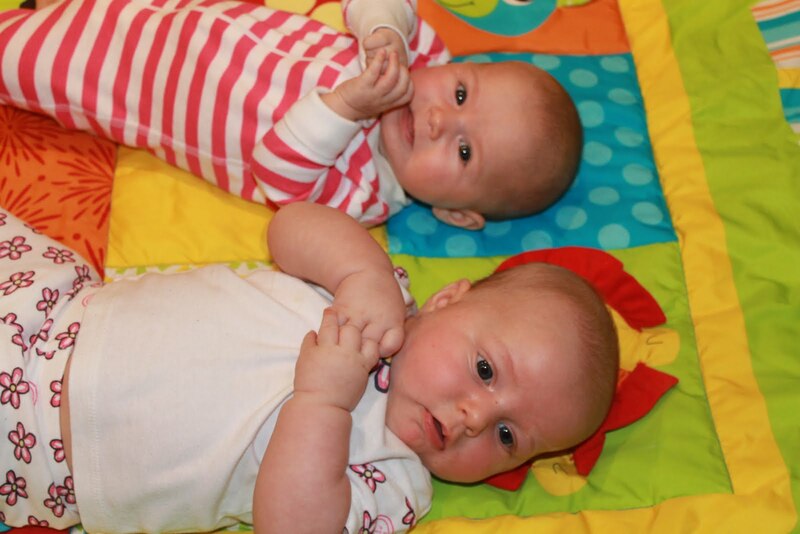 I wouldn't exactly call my days with almost 4-month old twins easy. In this situation EASY actually stands for Eat, Activity, Sleep, You. A friend of mine introduced me to this acronym and I really like it. 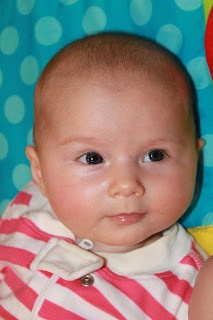 It is pretty much the same as the popular Baby Wise, "eat, play, sleep" approach. As with most new parents of twins, I longed for a schedule and structure to my day, in the early weeks. That's a bit hard to do with tiny babies who don't know the difference between day and night and a new mom who is struggling with feeding and never knowing if the babies are getting enough to eat. Once we established a feeding schedule (every 3 hours during the day, starting at 7am), the rest has slowly fallen into place. After the girls eat at 7am, they have mat time. They're becoming very interested in grabbing toys now. They'll spend some time on their tummies and even roll over, on occasion. We'll do some of our yoga movements. At some point between 8:15-8:45, they usually get a bit cranky. At the first sign of tiredness (rubbing eyes, yawning, crying etc), they're up in their cribs for a morning nap. At this point, I have some me (here's the Y) time, although it usually involves getting stuff done around the house. After their 10am feed, we often go out. Sometimes we walk in the neighborhood or the park, meet friends for coffee, play dates, run errands etc. On Fridays, we have yoga. I've noticed in the last few weeks that the girls have naturally adopted the eat, activity, sleep routine. Around 1 1/2 hours after eating, they start to get tired. I've also noticed that they're much happier and less cranky babies when they get proper naps in their cribs. Up until recently, we went out a lot. Yes, it's tiring to get two babies ready to go out, but it was much needed to keep my sanity :) It gave me confidence that I could handle two babies on my own around the city and it was great for them to experience different sights and sounds. Now that they're needing crib naps, I'm trying to be home more. We still get out at least once per day. These are definitely the conversations that I have each day! Ah, the coveted acronym, STTN! 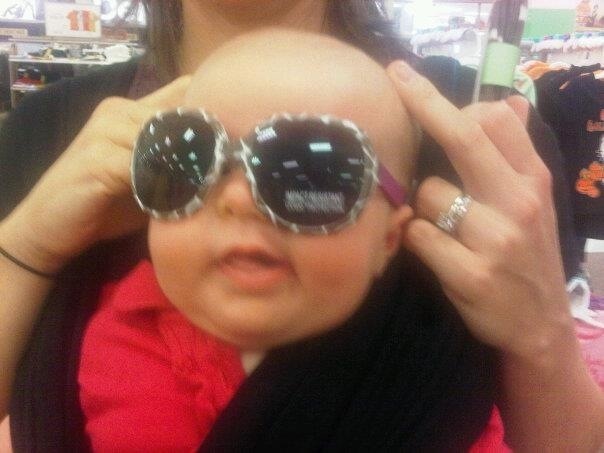 If you go onto any baby-related forum or blog, you will most likely see this acronym. 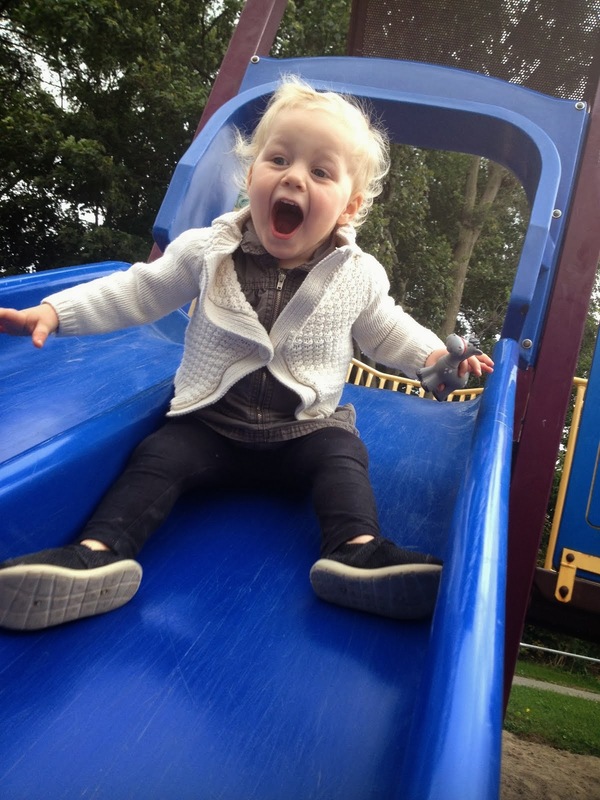 Most people hope and pray for the day that they can use it to describe their little one. As of this morning, I can officially use it to describe both of my babies! If you haven't already figured it out, STTN stands for "sleeping through the night." Quinn slept for 11 straight hours (from 7:30pm-6:30am). Teagan has been sleeping through the night for about 5 weeks now. I know that this is probably a one-off for Quinn, as it was for Teagan in the beginning. But, hopefully, this is the start of regular STTN for my little peanut. I don't want to brag but, I got 8 1/2 (consecutive) hours of sleep last night! I weighed the girls the other day and was shocked at the findings! At 15 1/2 weeks old, Miss Teagan is weighing in at 15lbs! Quinn isn't far behind at 12lbs! The girls and I went to their first baby yoga class this morning! This is the start of a series of classes that we'll be going to over the next several months (Mommy & baby, music, swimming etc). The class is called Itsy Bitsy Yoga and was at Zen Beginnings in Toronto. 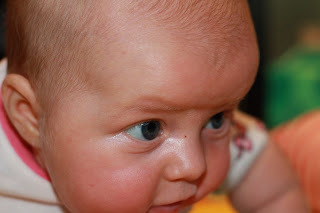 I know that the question on most of your minds is, 'what on earth do you do at baby yoga?!' The class is all about the babies. She showed us different 'postures' or movements to help develop baby's muscles, relieve gas and digestive upsets, build neck and back strength and relax them to help promote better sleep. Some of the movements are done to songs to ensure that we (the moms) don't move too quickly. The girls did incredibly well! There were no tears for the entire class. And yes, they were the only set of twins. There was another woman there who has twins but doesn't do classes with both of them, so she only had her daughter with her. I alternated back and forth between the girls. The instructor was nice enough to do everything twice so I was able to do each exercise with both of them. I have never heard such giggles coming out of the two of them! There are two of them and one of me. Sometimes I feel guilty because I'm constantly having to split my attention between the two of them, when it's just the three of us, that is. I feel guilty because it seems like they are being short-changed. Yes, a second child may feel the same way, but I think it's different. Teagan tends to be a bit fussier than Quinn, although she's improved a lot over the last month or two. As a result, I feel like I'm having to give more attention to Teagan in order to calm and soothe her. Quinn is so relaxed and happy to just kick away on the play mat. I'll look at her and feel guilty. Part of me wonders if she actually realizes this and fusses to get attention sometimes. Even when both girls are happy, I find myself going back and forth between the two. I sometimes feel like I'm not doing enough with either of them. I know that this is my issue. I know that my girls aren't hurting for attention or love. Life as twins is all they've known, even though they don't acknowledge each other yet. I worked so hard to be able to tandem feed the girls but actually find myself feeding them individually more often than not. It's nice to have a few moments with each of them. I think that this is a common worry for parents of twins. I think that many parents of singletons probably feel this way upon the arrival of a second child. I know that I'm certainly not alone! Anyways, my feelings of guilt will subside, I know. I'm doing the best I can with the girls and love our time together, even if I do have to split it between them. 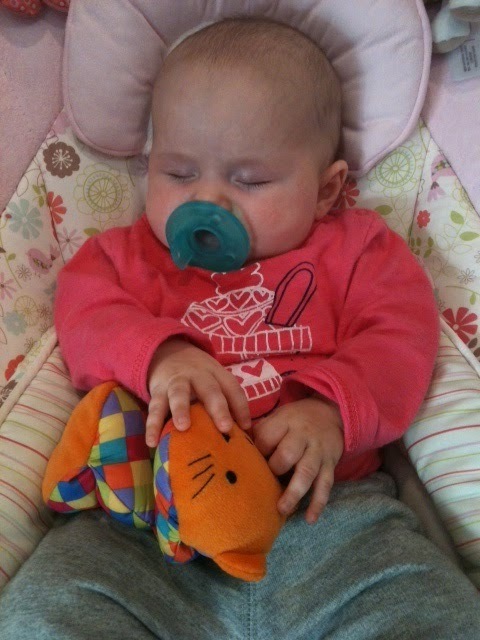 one hand in her mouth. What fun is a baby (Teagan) if you can't play dress up with them? As I previously mentioned, we took the girls on their first plane trip down to CT for Jenn's sister's bridal shower this weekend. 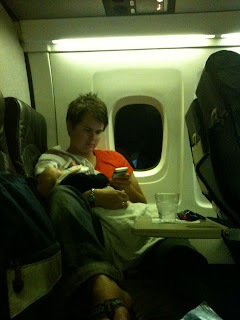 Have you ever walked on a plane only to see that a baby is sitting in the row behind you? For many of us, the sight of a baby on a plane causes us to grimace. 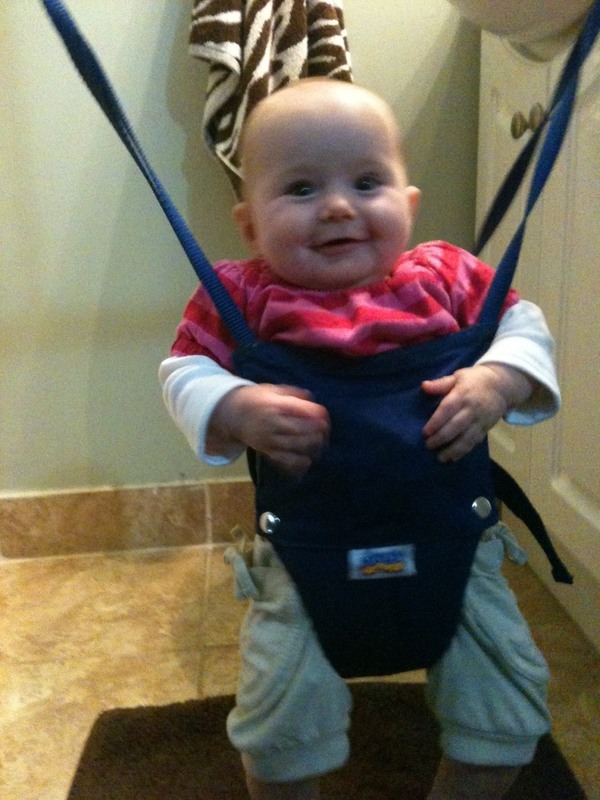 Now imagine walking onto a plane with two babies in your arms and seeing the looks on people's faces! Thankfully, the girls were great! On our trip down, our plane got delayed twice, for bad weather and then for plane issues. They ate their 7pm bedtime feed on schedule and slept for the entire flight. Fortunately, the way back was pretty much the same. 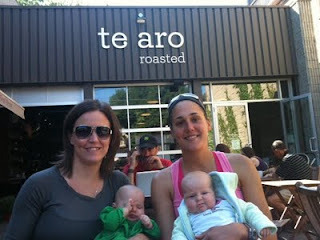 The girls had a great visit with Jenn's family. They attended her shower on Sunday and were definitely the hit of the party! ** Check as much as possible! We packed efficiently and checked 2 bags between the 4 of us. We checked their car seats as well. ** Umbrella strollers! This was a tip I received from other parents of multiples. Twin strollers are huge so leave them at home. Get 2 single umbrella strollers, then you can divide and conquer. I also got some stroller connectors for $12 on Amazon so we were able to attach the 2 strollers when needed. Ever since a friend of mine told me about this bra, my (current) world has changed! For the first few weeks, I would have to hold the pump in place which meant that I wasn't able to do anything while I pumped. Upon discovery of the Simple Wishes pumping bra, I now write my blog, cook dinner (including BBQ'ing) and eat it, all while "making meals" for the twins! Several people have now had the pleasure of dining with me while I pump. The pictures on their site are priceless. This woman is thrilled to be able to type away while pumping. This is multi-tasking at its best! 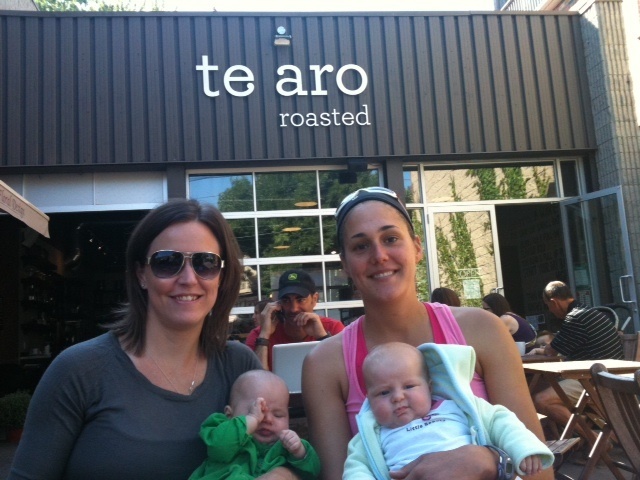 The girls and I often go to Te Aro, a great cafe in Leslieville (a Toronto neighborhood). I'm a self-professed coffee snob but this place makes the most delicious americanos. We usually meet up with one of my best friends, Auntie Husty (aka. Justine). She's becoming the Leslieville baby whisperer becoming one of the few people to put Teagan to sleep! They may not look thrilled but they really love this place! Here are a few more recent pictures!